My ceramic lecturing activity has covered a wide range of topics and I am always prepared to develop new lectures within my fields of expertise if it suits the event or the theme of the meeting at which it will be delivered. Please contact me if you would like me to speak to your Group. Before you check what lectures I currently do you might like to see an 8 minute long video of a short talk I gave recently prior to the sale by Woolley and Wallis of the teapot attributed to John Bartlam of South Carolina for £460,000. Whilst perfecting Cookworthy’s patented hard paste and producing some of the finest porcelain made in the 1770’s Champion was living through turbulent times. This talks illustrates the best of Champion’s Bristol porcelain and provides an insight into Champion’s personal problems which led eventually to a new life in America. As early as 1746 William Cookworthy had discovered in England the materials to manufacture hard paste porcelain in the Chinese style. It took him many years of experiment and observation to bring this dream into reality, and then only for a relatively short period. Showing the products of the Plymouth factory, detailing the trials and tribulations of starting his factory and assessing Cookworthy’s contribution to British ceramics which is greater than the short life of his factory may suggest. 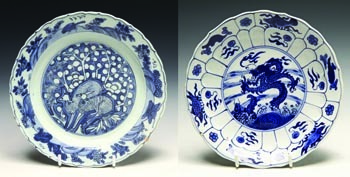 Wanli to Kangxi – Chinese Blue and White porcelains from 1572 to 1722. The best way to learn a massive subject, I find, is to bite off a tiny slice (in this case a mere 150 years) and try to understand the objects produced in the period. Concentrating on blue and white also limits the scope to a manageable degree. Illustrating the wares and their characteristics as well as a few fakes and reproductions and showing how styles changed over the 150 year period. 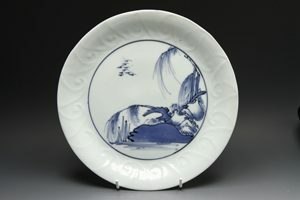 The importation of Chinese ceramics into England created a craze for Chinese style which had a profound influence on English ceramics. From early delftware, the first English porcelain and onwards almost unabated until today, chinoiserie scenes have appeared in England on locally made pots. This talk charts 400 years of this phenomenon. A comprehensive review of the porcelain produced by the Bow factory and the continuing debate about the factory’s early history. Illustrated with many interesting pieces from private collections and Museums. 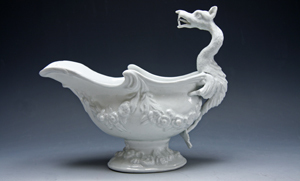 The history of the sole experiment in making Chinese style hard paste porcelain in England, concentrating on the wares of Bovey Tracey, Plymouth and Bristol, detailing the well documented history of these manufacturers and illustrating their wares. Detailing some of the history of the factory which remained comparatively unknown until archaeology uncovered remains from the factory in the 1990s. 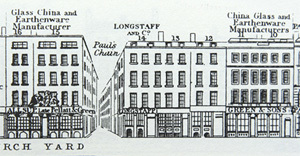 Since then many items have been attributed to the factory and these are illustrated. Also presented is some scientific work which throws some doubt on whether everything being sold as Isleworth is actually from the factory. The fascinating story of the a porcelain factory set up in Philadelphia in 1770 mainly staffed with English workers. Ultra rare pieces from the factory are illustrated and scientific work is presented suggesting more pieces may be attributable to the factory than the 20 pieces that are currently accepted. About the 18th century London retail trade for pottery and porcelain. Starting from the Chinese imports which were landed there London became a major centre for distributing ceramics around England, so much so that many English factories sent their wares to wholesalers in London before they were sold into the rest of the country. Ultimately these wholesalers tried to rig the East India Company auctions which resulted in legal action. Illustrated by topographical drawings and prints, extracts from legal cases involving the theft of china, and photographs of sample wares. An introduction to the first 100 years of porcelain manufacture in Japan. In the early 17th century it was discovered that Japan had china stone and china clay for the manufacture of hard paste porcelains. The result was striking and stylish decoration and potting, the beginning of and industry that still thrives today. 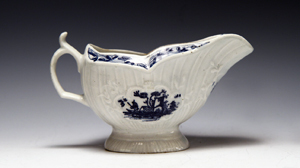 An illustrated lecture showing the wide range of sauceboats made in English porcelain and touching on the food history and fashions which made them desirable. Almost every factory made sauceboats, the early ones in response to the silver sauceboats being used in fine houses in the serving of equally fine French inspired cuisine. After these beginnings the sauceboat adapted as the rising and aspirational middle class sought to dress their own tables in fashionable style. A beginner’s guide to taking and editing better digital photographs of your ceramics collection. If you would like to me to speak please contact me.